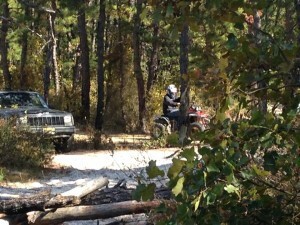 Damaging off-road vehicle use has become a major problem in the Pinelands National Reserve, especially in Wharton State Forest. In August the New Jersey Department of Environmental Protection released a draft Motorized Access Plan for Wharton State Forest, the largest tract of land in the state’s park and forest system, but then pulled the M.A.P. under pressure from motorized vehicle user-groups. The M.A.P. designated 225 miles for motorized access and placed sensitive areas and forest fire service road cuts (that were not roads) off limits to vehicular traffic leaving them open for walking, biking and horseback riding. According to New Jersey Department of Environmental Protection regulations (7:2–2.2) “The State Park Service shall designate or direct any and all recreational or other use on its lands and waters and within its facilities to such specific areas or locations within or upon said land, waters, and facilities as will be in the best interest of conservation, recreation, preservation and management of the natural and historic resources and the health, safety, and welfare of all persons concerned.” It is well within the rights of the DEP to close specific areas when that “action is deemed necessary for proper management and operation and/or in the best interest of health, safety and the general welfare of the public” (7:2–2.3). The Pinelands Preservation Alliance and the South Jersey Land and Water Trust documented some of the damage in 2014 when they mapped and surveyed sites of illegal off-road vehicle damage and dumping on state-owned lands in the Pinelands. They documented 114 damaged sites including sites in Wharton State Forest, which is by no means the complete list of the impacts our state lands have suffered from these illegal activities. 0An interactive map of the damage can be viewed at www.pinelandsalliance.org. Trails and roads subject to off-road vehicle abuse can quickly accumulate thousands of dollars in maintenance costs. In Wharton State Forest, a section of Tuckerton Road damaged from off-road vehicles reportedly cost $100,000 to repair. Less than one week after the repairs were completed the State Park Police caught an off-road vehicle driver going off of the road’s steep embankment. Had the vehicle been allowed to continue, it may have added thousands more to the already extensive bill. The NJ DEP estimates that off-road vehicle abuse costs the citizens of New Jersey up to $900,000 per year in damage to infrastructure and public lands. It is time we begin to reduce the prevalence of this costly activity in order to preserve our tax-dollars for more prudent uses in our State Forest. “Over twenty years ago, I found rare birds nesting on Jemima Mount, a beautiful forested area of Wharton State forest. Today, it has turned into an amusement park for off-road vehicles. Wharton has too many roads and other access points that are destroying the largest state forest in New Jersey. The state forest must limit the access points, increase enforcement, and limit the number of roads to save the remaining habitat available to rare plants and animals,” said Emile DeVito, Ph.D., Manager of Science and Stewardship for the New Jersey Conservation Foundation. Erosion and stream sedimentation are a big concern for riparian and aquatic species as well as our State’s anglers. The complete destruction some drivers have caused to certain vernal pools has reduced the amount of breeding grounds left for the threatened Pine Barrens Tree-frog. When vehicles drive down the sandy banks of the Mullica and the Batsto Rivers, they greatly increase erosion which causes soil sedimentation and the degradation of aquatic habitat. The problem of erosion caused by irresponsible off-road vehicle use isn’t restricted to just the riverbanks. Unethical drivers will purposely rut trails and wetlands areas to cover their vehicles in mud. The erosion caused by rutting leads again to river sedimentation and habitat destruction. There is no doubt that extensive damage has occurred in Wharton State Forest and elsewhere. “As a steward for over 1,000 acres of natural areas in the Rancocas Creek watershed, the Rancocas Conservancy knows firsthand the devastating impact of ORV use and the importance of active land management. We support the DEP’s MAP approach not only because it will protect natural resources, but because it will uphold the public trust that generations of New Jerseyans have placed in the State to safeguard our natural heritage,” said Chris Jage, Trustee with the Rancocas Conservancy. resources effectively by placing some roads off-limits to motorized vehicles. The Wharton State Forest MAP is no different from management plans in all National Parks and State Forests, where many sand roads are not open to driving by the public in the interests of protecting natural resources and public safety. This means that some visitors may not be able to drive on a sand road they had used before. It is a shame that the situation has reached this point after years of work increasing fines through state legislation and local ordinances, increasing public awareness about the issues and creating a State off-road vehicle park. But the problem persists, and the State of New Jersey has a responsibility to protect the natural and cultural resources of all the land it owns. The MAP will keep vehicles out of places that are currently being damaged, so these places can recover, and keep undamaged areas from becoming the next ORV playground. The Department of Environmental Protection must follow through and implement this important plan — Wharton State Forest won’t survive if something isn’t done to limit the damage. “As citizens we do not merely have rights to public land — we have responsibilities. Wharton State Forest is a vessel for our natural inheritance and it is our solemn duty to ensure its continuity. Illegal off-roading destroys habitat and we should not let this practice threaten an ecosystem that has been preserved for thousands of years. As stewards of the land and we must work together in order to save our last remaining wilderness and the rights of our citizens to enjoy its infinite beauty,” said Jason Howell, Stewardship Coordinator for the Pinelands Preservation Alliance.